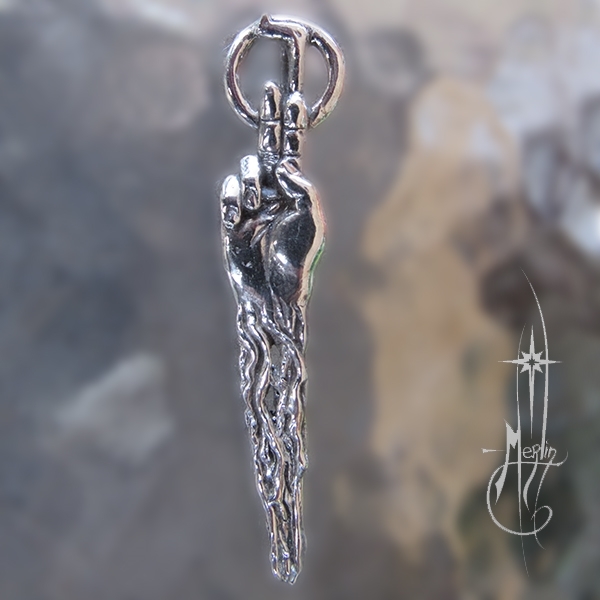 After reviewing the collection of Tarot Amulets I have created, I started developing larger versions of the designs for those who wish to have a heavier more detailed piece. While possessing a rather strange name, this particular amulet has always been a favorite of many who find themselves teaching through example and discover themselves an authority through life experience as well as study and reflection. Because of the larger size, have the opportunity to add detail with fingernails and the lines on the palm. In this rendering of the design, I included the “magic “M” found intersection with the “life line”. Because of it’s mass it “gives weight” to the meaning of the piece. When setting up a tent One knows the importance of a good tent stake. If the stake is not solid, deep and well anchored, the tent will collapse. The Hebrew letter associated with the Hierophant is Vav<: “the tent stake”, a well-grounded object (when set) will hold up an entire community. The concept is associated with the very grounding sign of Taurus. offers a blessing to be in turn redirected to others. Its effect continues through the members of a given community thus weaving the fabric of love and strength through out society. reaching into the realm of the spirit while grounded into the rituals of daily life. the art of bestowing the divine to each other is what gives religion its lifeblood. to serve the community through Teaching, Healing and Service.